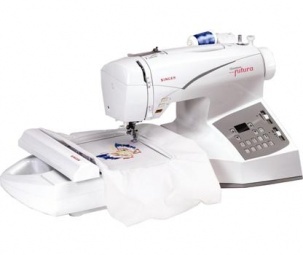 You can do it all with the SINGER® FUTURA™ sewing & embroidery machine. You can sew purses to pillows with ease, then use embroidery to add individuality to everything. The SINGER® FUTURA™ sewing & embroidery machine is powered by your PC, so you’ll have a whole world of designs and ideas at your fingertips. It sews. It embroiders. It brings out the creativity in you. *PLEASE NOTE: An update for Windows 8 is not available on this model. However, the software for your CE-200 can be updated so that it will run on Windows XP, Windows Vista and Windows 7 ( 32 or 64 bit). To accomplish this, you will need to purchase the FUTURA 2.5 upgrade that will upgrade your software to functionality equivalent to a SINGER® FUTURA™ 3 sewing & embroidery machine.